Written by a priest who took vows over forty years ago, The Five Vows shows how anyone, not just those in a religious profession, can live spiritually in a crazy, secular world. More than mere promises, the vows are powerful blessings designed to empower us in our everyday living, from the altar to the office to whatever your job or station in life may be. No longer do you have to give up everything to find God, nor do you have to turn your back on your worldly obligations. The Five Vows gives you concrete ways to make your life sacred—the one you're already living—in whatever way you envision it to be. 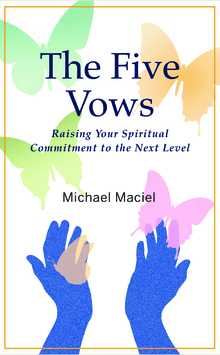 The vows are the next step in your spiritual path. They are personal and private, they illuminate the soul, and they are life-changing. Isn't it time to raise your spiritual commitment to the next level?